In addition to the seismic upgrades, the city is planning new cycling and pedestrian improvements across the bridge, which could include a cycling/walking path down the centre of the bridge with food carts and viewing areas. The city says there will also be opportunities for big public-space ideas such as community art, innovative seating and lookout stations for scenic views. The first phase of the public consultation is an online survey on the City of Vancouver website. The survey will be open until May 10. Its imperative that you are heard. Also happening will be a series of open houses and workshops beginning April 10. 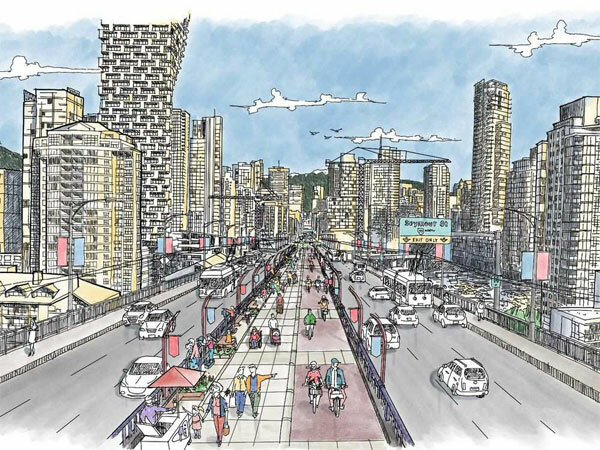 • April 16, 4-8 p.m. | Vancouver Library Promenade, 350 West Georgia St.
“We’re looking forward to hearing what connects people to Granville Bridge both now and into the future,” said Lon LaClaire, the city’s director of transportation, in a statement Thursday. The city says the goals of the makeover is to make walking, rolling and cycling across the bridge safe and comfortable for all people. The public conversation about the future of the Granville Street Bridge will continue with another two phases of engagement this summer and fall.